For young children, crafts are a useful tool to reinforce key fire safety concepts. No matter what topic you're discussing, the experience of crafting helps actively engage a child in the learning process. To a young child, a firefighter might seem frightening. Kids can often panic when they see someone they don't know, and the safety gear firefighters wear can be scary to a child. The last thing firemen want is for children to be hiding from them if they need help. As you show your child pictures of firemen in their safety gear, complete this simple hat craft to reinforce that firefighters are here to help keep everyone safe. Download the firefighter's hat pattern and printable instructions. Cut a large oval shape from your sheet of red craft foam. 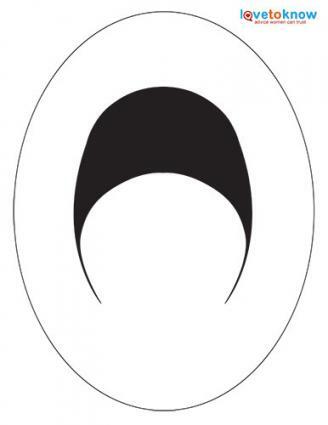 Make the oval as big as possible, since this will be the base of your hat. Fold your oval shape in half. Leaving a 1 1/2-inch border, begin cutting an inner circle around the foam. Stop cutting about 2 inches from the center line. This creates the domed top of the hat. Open the red foam oval shape and push the cut out oval forward. If necessary, use your scissors to even out the shape. To make the emblem, cut a small oval measuring 3 inches from yellow craft foam. Place the oval horizontally and trim the top with scissors to make a small point. Write a number or the name of your town's fire department on the emblem using a black marker. Attach the emblem to the hat with liquid school glue. Learning when to call 911 is an important fire safety skill for children of all ages. As you complete this craft project, you should discuss the following points with your child. When there is a fire, or you smell smoke, leave your home immediately. Do not stop to pick up toys or other items. Call 911 when you are safely outside the home. If necessary, ask a neighbor to use their phone. When you speak to the operator, they will want to know your name, address, and what type of emergency you have. It's okay to be scared, but you need to speak slowly and provide as much information as possible to allow the operator to send help. You should never call 911 as a joke or prank. In many states, this is considered a crime because it takes resources away from people in need of legitimate assistance. Use letter stickers to write "See" at the top of the page. Use tissue paper and glue or washi tape to make an illustration of a fire below the letter stickers. Use letter stickers to write "Call" below the fire. In a small bowl, mix ¼ cup of glue and 1/4 cup shaving cream together until evenly blended. Don't put papers, clothes, or other flammable items near hot objects. Don't play with fire-starting items like matches or lighters. Don't touch hot items like a stove, campfire, fireplace, or room heater. Electrical outlets are not toys. Tell an adult if you see a fire hazard. As you're discussing fire safety tips, write each tip on a notecard accompanied by a small illustration. For example, the tip "Stay away from candles" could feature a candle inside a "no" sign. The more cards you make, the more challenging the game will be. Use the six tips listed above as a starting point or challenge kids to come up with their own fire safety tips. You'll need two copies of each card to play your game. If you're working with a group of children, let each child make their own set of cards and combine the sets to play your game. (Since the tips will be written on each card, it does not matter if the children draw slightly different pictures). If you're working with a single child, you can use a color copier to make a second set of cards. To play your game, place the cards face down on the table. Line them up in a grid formation. Have the players take turns flipping over cards to find matching pairs. At the end of the game, the player with the most pairs is the winner. Enchanted Learning Fire Crafts: This popular website provides crafts and projects such as a printable fire gear book, a firefighter flag to color, a fire truck cardboard box project, an edible fire truck art made from graham crackers, and multiple coloring pages. DLTK's Fire Safety Crafts for Kids: Visit this site to learn how to make an egg carton fire truck, fireman and Dalmatian toilet paper roll people, a fire truck paper craft, and a fire engine cut-out puzzle. Preschool Education Fire Safety Crafts: Crafts featured on this website include a fire painting, flame painting with marbles, paper folding crafts, and a collage. Although fire safety crafts can be a fun way to reinforce key concepts, some rules must be practiced to ensure children understand what they should do in an emergency situation. Stop, drop, and roll if you catch on fire. Get down low if there's a fire. Memorize multiple escape routes at home, school, and after school groups. Escape plans should include where to meet afterwards if there is a fire - at the neighbors, a specific tree, or elsewhere. Children should know what a smoke alarm sounds like. Children should be able to touch a door to see if it's hot before opening it and understand how to unlock doors and open any security bars on their home windows. By taking the time to complete educational craft projects and practice basic fire safety skills, you can rest easier knowing your children are well prepared with the knowledge they need to stay out of harm's way.